Monday, December 18, 2017 ~ 2:00 p.m.
Sunday, December 17, 2017 ~ 2:00 – 3:30 p.m.
Donle J. Yardley, 91, of Ashland, NE, died Wednesday, December 13, 2017 at Gateway Vista in Lincoln, NE. He was born at home in rural Washington County in 1926 to Carrie (Barger) and Omer K. Yardley. He grew up in the Ashland area and later worked for the Lincoln Water Works and the U.S. Post Office. He also farmed throughout his life on his 2nd generation family farm near South Bend. He was active in the First Congregational Church, the American Legion, and the Parent-Teacher Association. He also started a series of gun shows in Lincoln which brought people from many states including Hank Williams, Jr. 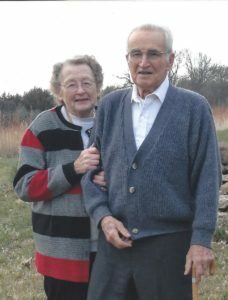 He married Margy Hilfiker in 1953 after serving in the U.S. Army. They had 6 children who survive him: Lora Yardley (Jack Wyant), Sidney Yardley, Mary Osborne, Owen (Laurie) Yardley, Lisa Yardley, and Roy (Julie) Yardley. He also enjoyed his many grandchildren and greatgrandchildren. He was predeceased by wife Margy, parents, siblings Delmar, Norman, and Mary Ann Rosenboom, sons-in-law Ron Osborne, Ken Cauble, and granddaughter Elizabeth. May your memories of your parents sustain you in this time of sorrow. Sympathy and prayers to your family. They were very nice neighbors. I’m so sorry for your loss but know how happy your Mom and Dad are to be back together again. It was so apparent they loved each other and their family so much. I hope all the happy memories help you through this difficult time.